I modeled this My Obstacle Course station activity after several packaged toys I’ve seen that come with pattern cards for children to replicate. It’s so easy to make your own and custom fit them to what your child needs to work on. 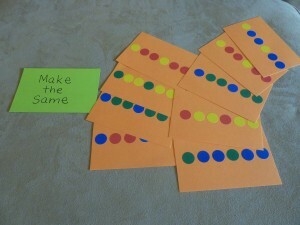 Make the Same station activity using color coding dots. 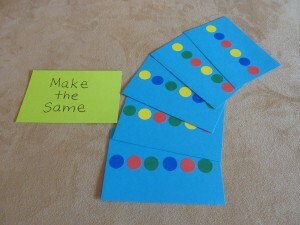 and some index cards (I used colored but plain white cards might work even better). 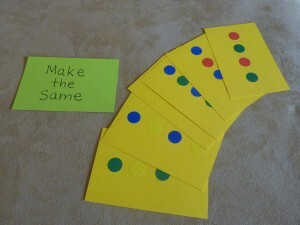 I used the sticker dots to make basic patterns – ABAB, AAB, ABB, ABC, etc. At the station, I provide paper and stickers, have him choose a pattern card and using the stickers, he peels and sticks the dots on to make the same pattern. If this activity is easy for him, I would have him choose several different cards to do. If it is too challenging, I would limit it to two. I like that this works on the skill of patterning as well as building the fine motor skill of using their fingers to peel, hold and place the sticker onto another sheet of paper. This also requires some planning because they have to put the sticker in a place that will allow the others will fit. If planning is challenging, you can place lines or x’s on the paper for them to place the sticker on or above. These sticker dots have other uses as well that I will post on in the near future. 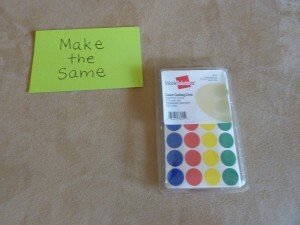 I really like finding inexpensive items that have multiple purposes for building different skills!